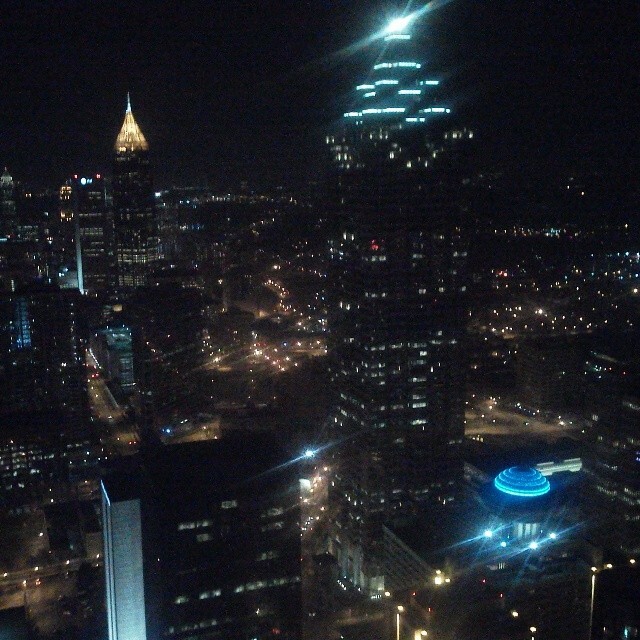 Atlanta skyline viewed from Peachtree Hotel. I took a trip to Atlanta this past week and relived some of my life in the 1980s when we would travel there often. It has changed quite a bit since then. I’d love to have a job where I go to cities to compare and contrast my city’s virtues with those of others. First thing I did when I got off the plane was ride the MARTA to the Martin Luther King Jr. memorial site and National Park. That was a highlight and certainly worth the very cold two hours. At times, it was hard to keep from crying reliving so many struggles and bad moments in Civil Rights history. The Eternal Flame was a good space to reflect on all that I had seen. As I walked 12 blocks to the attend the conference I was in town for (more on that later), I observed plenty more of Atlanta. I saw statues, pubic art, homeless, Georgia State University, etc. The most interesting might have been the Atlanta Streetcar, which will be 2.7 miles of track with 12 stops in the downtown area. The tracks are being laid in the lanes of traffic. I got jealous, but then I saw the $92 million price tag. On Friday, I walked the entire path of the streetcar. Plenty more statues, public art and odd architecture. The city hopes that the streetcar will increase the business and tourism in the corridor and that it would eventually grow beyond the current course. I’m going to apply this concept and create a comparison for Richmond and write about it for Richmond.com. Like I said, I saw plenty of homeless. I saw an example of where one gentleman tore up a dollar bill for some reason. I’ve always believed that giving a homeless person money is the wrong thing to do, but rather giving to organizations that care for homeless and help them to find jobs and learn to take care of themselves. I’ve seen these in other cities, like Virginia Beach, but I wish Richmond would allow for a program to collect money to combat homeless by re-purposing parking meters. More fun stuff. At one point while I walked around downtown Atlanta, there were two different cars sitting at a stoplight in downtown Atlanta blasting Charlie Daniels’ “The Devil Went Down to Georgia.” What are the odds, right? At another point, I watched a guy drive right through a parking deck gate with a Subaru. It looked nothing like Burt Reynolds in “Smokey and the Bandit.” No kidding. Fun in the city.